Offering investors solutions and creating value together over the long term. 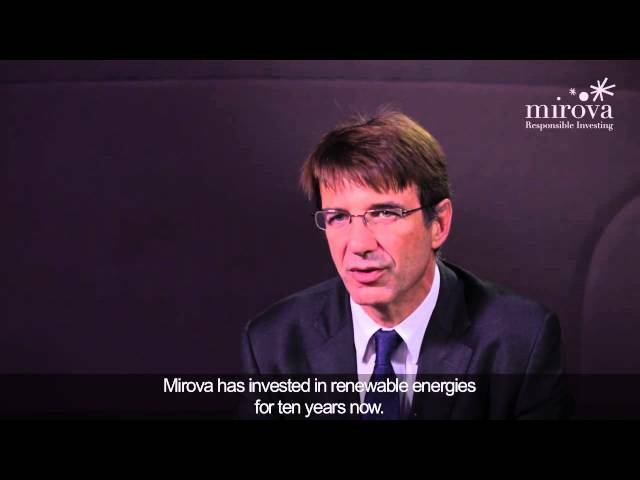 This is Mirova’s ambition,’ explains Philippe Zaouati, deputy CEO of Natixis AM, head of Mirova investment division. You could say that the solutions to the economic crisis are not necessarily the answers to the environmental crisis, or that the two are mutually exclusive. But is that a reasonable answer? Many investors have already turned to socially responsible investing. Responsibility has become a pivotal concept. Investors are taking a broader view and are more concerned about the sustainability of their investments, the part they play in financing the economy, their responsibility as shareholders, the medium-term potential of their investments, etc. The challenges of the future are investment opportunities to be seized.This is where we step in. and solidarity-based economy, and companies that help investors play an active and responsible role.Obviously, this starts with extra-financial research and the integration of ESG(1) criteria. But we need to go much further. With Mirova, the responsible investment division of Natixis AM, we decided to combine our different areas of expertise in a single investment division, one of its kind in Europe,gathering around 40 specialists and have organised our offering in 4 pillars:management of listed equities, infrastructure financing(2), Impact investing(3), voting and engagement advisory services. With Mirova,we continually strive to stay cutting edge by strengthening our position within the French market, and to become a key player on the international scene. We have therefore built a research partnership focusing on sustainable themes with Cambridge University. (3) Impact investing: investment with a strong social/environmental impact.